I had to hunt a bit for this photo location. I could see Mt. Hood clearly while driving up Hwy 35 from Hood River. Pulling off the highway at a random road, I came into the tiny community of Pine Grove. I parked near a warehouse and noticed the orchards behind it and Mt. Hood beyond that. Walking down the tracks a ways, this pretty view came to be, and I was glad I hunted it down! Great view of the mountain! 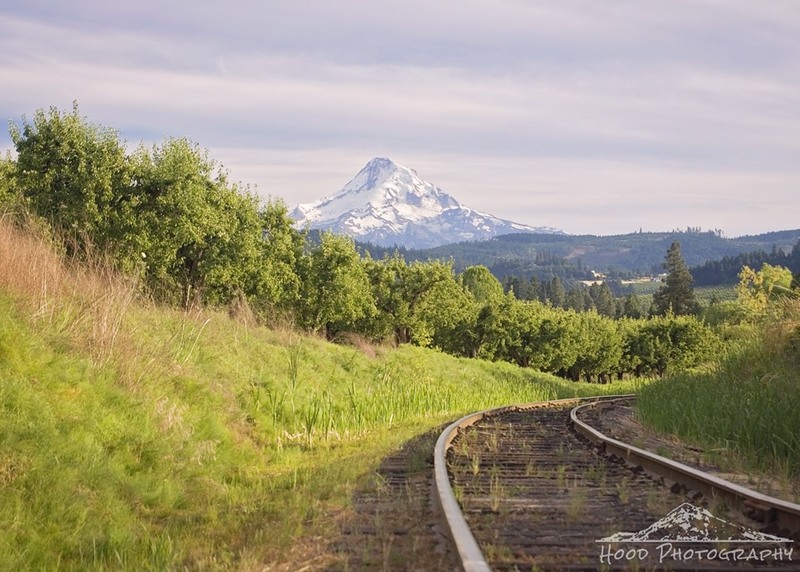 Gorgeous view of Mt Hood! Enjoy your day and the week ahead! So glad you hunted it down and share it. Gorgeous view. Love the peek-a-boo of the tracks. Stunning photo and the view is just gorgeous! When I'm driving up Hwy 35, there's always such great views of Hood, but never any place to pull over. Good for you for finding a spot!